Ideally, users will verify their email address as soon as they receive the verification email message, but agents can also verify a end user's email address on the user's behalf. If you require users to register before submitting a request, any support requests submitted by unverified emails will remain in limbo in the suspended ticket view (in other words, they won't create tickets in your other views and agents cannot work on them). Agents and admins can verify a user's email address on their behalf. Agents can verify end-user accounts only. Admins can verify all users except the account owner. 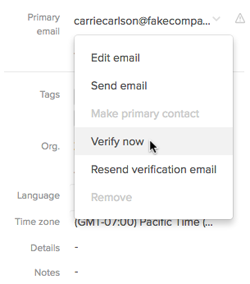 You can also resend the verification email so that the user can verify their own email address. Or you can verify user email addresses when adding users via the API (see Zendesk API: Users). In that case, you might want to disable verification emails for users (see How can I disable end user verification emails?). Note: If you started using Zendesk Support on or after August 21, 2013, the options for verifying email addresses are not available until you activate your Help Center (see Activating Help Center). After you add the user (see Adding and managing end users), open the user's profile. Click the down arrow next to the user' email address and select Verify Now. The user's email address is immediately verified. If the user has submitted any support requests, those requests are not automatically added as tickets to views, but can be manually recovered from suspended tickets. Testing - You are testing your workflow and you want to create test users and tickets to test automations and triggers. You can add some test users for email accounts that you own and easily verify those new users. Adding Agents or Known Users - When you're adding new agents (or other known users) to your account, because you know that their email addresses are legitimate, you can verify them as you add them. If I manually verify an email, as described in this article, does the user receive another email? And do they still have to go somewhere to create a password? Just wondering what the user experience is so I can support their questions. No additional email is automatically sent if you verify the user manually. If you look right below the screenshot in the article, the last paragraph in the section tells you how to manually re-send the verification email if you'd like. The customer will still need to create a password on their own to log in to your Help Center. They'll be prompted to do so when they try to log in for the first time. Administrators also have the ability to reset or set user passwords. You can find more info on that here: Managing users. Can I auto-verify users in bulk through the admin web interface or does that have to be done with the API? Hi Colin! Welcome to the Community! I did a quick sanity check on this and was able to confirm that it's not possible to bulk-verify your users in the agent interface. However, as you mentioned, it's definitely possible through the API. You can find the corresponding endpoints in our Developer resources! Does this have any affect on users trying to view their tickets via the "My Tickets" section of the Mobile SDK? Hi! We don't use user registration however we find sometimes (does not happen too often) users claim they do not receive our support message from Zendesk. If the user shows as unverified could this affect the customer receiving the email on their end? This should not affect the SDK if the users are manually verified in the agent interface (or if they follow standard verification to begin with). Not verifying an email address should not affect end-users from receiving emails from you. Past asking your users to check their spam folder, please feel free to submit a ticket to support@zendesk.com if you find this is a problem with your Zendesk. How, if at all, does this affect our site if we are using SSO/PTA with a separate identity provider? When an SSO provider is used for user authentication the users are provisioned and authenticated through the third party service configured outside of Zendesk. As a result, the users are created with verification by default. You can create a user that is verified automatically by passing in a verified: true key in a request which is what SSO does natively. Do the welcome emails expire after a given amount of time? If so, how long? Apologies for the delayed response on this. The verification links in those emails are good for 24 hours. Hello, on part of "Resending the verification email for a user".. is there a way to slighty modify that process? - the email being sent with "Welcome to 'X'. Please click the link below to create a password and sign-in. To clarify, when you re-send a verification email you want to edit the copy? We want to personalize it a little bit, so that it sounds a little bit more human and according to our tone of voice. So that it's not that far away of the way that we communicate to our users, so that they feel more motivated to do it, and don't consider it phishing. Thanks for confirming. Yes, you can edit the copy. See the article "Customizing end-user account emails" - the last section is on customizing the verification email. Let me know if that works for you or if more questions arise. That's indeed exactly what I was looking for. Do these fields work with dynamic content as well? With different languages? Hey Marrit! Sorry for the delayed response! Yes, you can use dynamic content in your Verification email body. You can see the other areas where dynamic content is supported in our documentation! we are using Zendesk PHP SDK to register users and now by default when a new user is added it gets also automatically an email to verify its registration to the zendesk instance. Before 20/11/2017 the users never got a new email when they were added to our zendesk instance until we did the verification manually. I wanted to know if is there any option I can use in the PHP SDK registration call to not send automatically the verification email to the newly added users, means I want to do the verification manually as before. I have checked on the documentation of your API and couldnt find anything useful for this topic. Users can be created without sending out a verification email, by passing a "verified": true" parameter, via this API endpoint. I hope this helps! Hi Jim. Zendesk Support's API gives access to user information, including verification status. Feasibly, you could write a custom integration that uses one of the services that you mentioned in conjunction with Zendesk APIs. There is no "native" integration, however, with one of these 3rd party verification services. Thanks for the info Bryan. The verify email notification which is automatically sent references both our Customer and Partner Help Centres. Is it possible to only send reference to Customer Guide for Customer branded tickets and the link to Partner Guide for Partner branded tickets/users? As outlined in Understanding user authentication with multiple Help Centers, currently all help centers will be listed in the welcome email, password reset email, and identity verification emails. I recommend adding a comment to that article to let our developers know that separate help center logins is something you value. I think this documentation is a little out of date? It says: Until their email has been verified, a user's support requests remain in limbo (in other words, not added to your views and agents cannot work on them). Yet testing on this in our system proves this isn't the case - an unverified user sending an email creates a new ticket that is able to be progressed. We just implemented Zendesk. Do I need to verify a group email address? If I've never used a specific group email address and I want to CC them on a ticket, will it go through or will it be stuck in limbo? Can the verification emails be disabled for end users submitting tickets through my custom form?